Monotype Process: I use Plexiglas plates and build layers of color by rolling the ink onto the plate and using torn paper and other materials to create the layers. I either mask the inked plate with the paper or roll the ink onto the paper to print directly onto an existing image. The plate passes through the press multiple times building the composite print. I often make “ghost prints” with residual ink that is left on the plate after the initial pass through. These faint images offer a different, more minimal impression, which has a distinctive look. I work at Zea Mays Printmaking Studio in Florence, Massachusetts. At Zea Mays we honor the rich tradition of printmaking by exploring alternatives that are safe for artists and the environment. 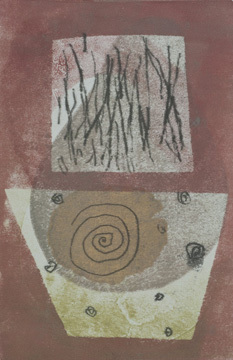 We research new developments in alternatives to toxic printmaking. We test products and methods and strive to demonstrate the greatest aesthetic potential of each new medium, documenting our research extensively and maintaining a library of material on safer printmaking. The studio is a solvent-free, non-toxic working environment. Working in this environment offers a sense of community with shared values that enhances my work.